Electrical and Electronics Engineering department was established in the year 1998 and it is offering 4-year BE programme. The department has 10 qualified and experienced teaching faculty and 6 technical supporting staff with total student strength of around 300. The department is conducting seminars, symposia and workshops for the enrichment of knowledge of staff and students. The department has its own student association for motivating the students to prepare for inter and intra college competitions, paper presentation and for several placement-oriented activities to make them employable in their professional career. Several industrial visits and in-plant training are being arranged to the students to have a practical exposure. EEE department has four well-equipped classrooms to have lecture classes. Teaching aids such as LCD’s, OHP’s and blackboard facilities are available exclusively for the department. A seminar hall with public address system and LCD is present for conducting seminars and symposia by all the disciplines. The department has spacious laboratories with equipments as per Anna University requirement. 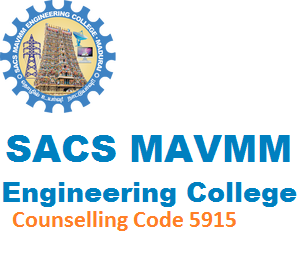 To transform the students into full fledged and conscientious professional engineers with sound theoretical knowledge and excellent practical skill in the field of Electrical & Electronics Engineering, committed to serve the society in general and the nation in particular. PEO1: To develop the students’ knowledge in mathematics, science, computing and engineering fundamentals and also to enhance in doing postgraduate programs or to get employed in national or international organizations and with government agencies. PEO2: To bring out students’ ability in analyzing, designing and creating innovative solutions and projects for solving engineering and social problems. PEO3: To inculcate in students organizing capability, presentation skill, communicating ability, team work, ethical practice and social responsibility. PEO4: To provide skills for continued independent, life-long learning to become experts in their profession. In this lab, students are trained to operate D.C. machines, A.C. machines and transformers through experimentation.. The lab comprises of major equipment like DC motors and DC generators, Single phase and three phase Induction motors, Single phase and three phase transformers, Synchronous Generators and motors. Imparts hands on experience in verification of circuit laws and theorems, measurement of circuit parameters, study of circuit characteristics and simulation of time response. The experiments conducted include resonance phenomenon in electric circuits. The major equipments in this lab are Cathode Ray Oscilloscope, Audio Frequency Oscillator, Regulated Power Supplies and LCR meters. Provides a platform for understanding the basic concepts of linear control theory and its application to practical systems is very important. Transfer functions of servo motors are determined. Different types of systems are analyzed. The lab comprises of major equipments like DC Motor and DC Generator, AC Servomotor, DC Stepper motor, DC Position control system and AC Synchro transmitter and receiver. Here students are exposed to understand the characteristics and determination of the parameters of various solid-state devices such as diodes, transistors and the application of these devices as amplifier, oscillator and regulator. The major equipments available in the lab are Cathode Ray Oscilloscope, Audio Frequency Oscillator, Regulated Power Supplies and LCR meters. Imparts a sound knowledge about the characteristics of switching devices like SCR, TRIAC, MOSFET, IGBT and their applications in industrial fields as Rectifiers, Inverters, Choppers and AC voltage regulators. The major equipment are Single phase and Three phase SCR controlled rectifiers, Single phase and Three phase IGBT based PWM inverters, MOSFET based chopper kit, Trainer kit for characteristics of SCR, MOSFET, IGBT & TRIAC, Series and parallel Resonant converter. Aims to fortify the students with an adequate work experience in the measurement of different quantities and also imparts the expertise in handling the instruments involved. The objective is to train the students in the measurement of displacement, resistance, inductance, torque and angle etc., and to give exposure to AC, DC bridges and transient measurement. The lab comprises of major equipment such as Linear Variable Differential Transformer, Hay’s Bridge and Anderson’s Bridge kit, Schering Bridge and Whetstone Bridge kit, Kelvin double bridge kit, Instrumentation amplifier kit, DC potentiometer, Cathode Ray Oscilloscope, Bourdan tube trainer kit, Analog to Digital converter. Helps the students to acquire software development skills and experience in the usage of standard packages which is necessary for analysis and simulation of power system required for its planning, operation and control. The lab is equipped with the latest PCs and peripherals and AUPOWER software for power flow, fault and stability studies. The power supply back-up is ensured with UPS. The students also acquire knowledge to develop simple C programs for Power flow solution of small systems and solve Unit Commitment and Economic Dispatch problems.